Linda Mochel ends her day at sunrise, heading home after tending to patients overnight at a South Bend, Indiana, hospital, where she’s worked as a registered nurse for more than 25 years. She works overnight shifts so she can stay home during the day to take care of her ten children. 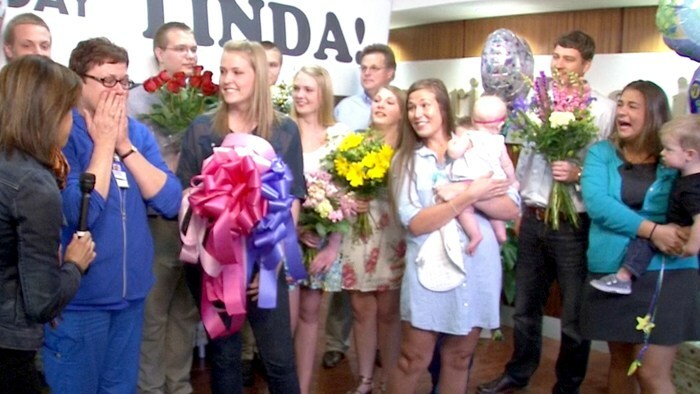 But this morning would be far from ordinary, thanks to TODAY’s "Mom’s the Word" celebration — a week of surprises for mom. Linda's six youngest children were joined by her older children, who live out of state and don't get to see her very often. That alone was enough to set off the waterworks. 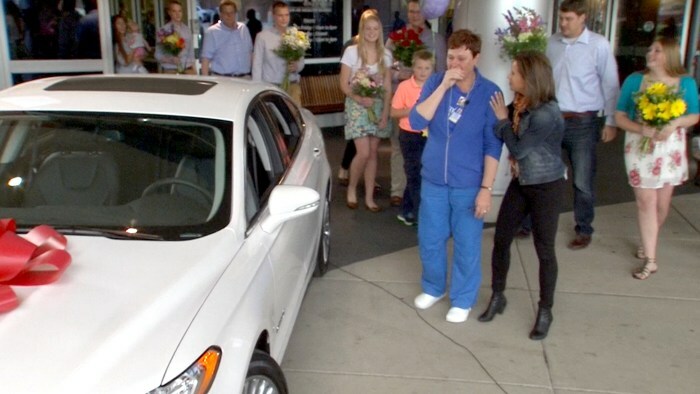 Then TODAY's Jenna Wolfe unveiled the final surprise for Mochel: a brand new car! Wednesday’s edition was so emotional that it left the subject barely able to say a few words. “We’ve taken the concept of Mother’s Day surprises into Mother’s Day shocks,” TODAY’s Savannah Guthrie quipped. Mochel — a mom of ten kids, ranging in age from 10 to 31 — has always worked the night shift so she could be home for her children during the day. “So many sleepless nights and days — and she has always been there for us no matter what,” her daughter Elizabeth "Libby" Klatt, 28, told TODAY. On Wednesday, Mochel’s husband Roger and the kids who still live at home ambushed the mom in the hospital lobby with a little help from TODAY’s Jenna Wolfe. As Mochel, 53, was ending her shift, the family presented her with balloons and flowers as they wished her a happy Mother’s Day. In a video taped for TODAY, her kids explained why Mochel is so special to them. "I love my mother because she helps me with my homework and is the best mom ever," said 10-year-old Joe Mochel. "She is helpful and kind and loves me even when I mess up," added Abby Mochel, 17. "She provides for me, she loves me no matter what and she gave me wonderful people in my life to look up to," noted 15-year-old Maggie Mochel. "Even though you work all the time and have to take care of my other brothers and sisters, you still have time for me," Matt Mochel, 23, told his mom. Six kids still live at home, one child is away at college, and the remaining three live out of state. “I’m shocked,” Mochel said after clutching her face in surprise and holding back tears. Mochel’s remaining children then suddenly walked in to surprise her, some holding their own kids. Mochel doesn’t get to visit them very often because her 17-year-old car isn’t reliable enough to drive out of state. So there was one more surprise for the whole family. As part of the celebration, Mochel received a 2014 Ford Fusion Hybrid, which was parked at the hospital entrance, complete with a giant red bow. That’s when the tears really started to flow. "I can't believe it," Mochel said, then turning to her 10 kids and two grandkids. “I love you guys with all my heart."